Did you know that chauffeured services can be reserved via Global Alliance’s website? 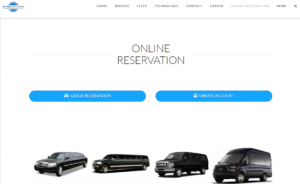 With a few simple clicks, professional limousine service can be at your doorstep. The Online Account allows you to book, view past, present, and future trips, and change reservations. You can also download receipts, and track your vehicle while in route and until the trip is completed. To set up your online access for the first time choose the Online Account button. Click on “Start Here” in the Activate On-Line Service window. Fill in the required registration information. You will receive an activation confirmation email along with a separate email containing your temporary password. Click on the link to return to the login page and enter your User ID and password. You will also use this ID and password for the mobile app. Established Global Alliance clients should utilize Online Account to book new chauffeured services and manage existing and past services. Please note that the Quick Reservation link shown on the left in the above image generates a guest booking that does not employ your pre-existing profile details, including contact and billing information and automated reminders, chauffeur details, and status settings. Online Account is therefore your preferred option for booking via our website. Interested in the Global Alliance mobile app as well? We’ll have more information on how to obtain and use it in another news item tomorrow. Please check back for that, and feel free to reach out to Global Alliance’s team if you have any further questions about the Online Account.